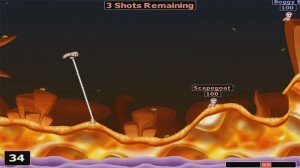 In #6 I am showcasing the infamous “Indian Rope Trick” present in Worms 2 and earlier versions of Worms: Armageddon. It was quite popular in Worms: Armageddon and was later turned back on using a special mode “Test Mode” to allow player to use it once again. Here I am showing Worms 2 where this glitch clearly works. Surprisingly, not all Worms: Armageddon glitches work in Worms 2 even though they share a lot of the same code.